On January 28, 2010, Public Safety Manager Jack Harris in statements given to the media stated that the proposed budget/personnel cuts to the police department would have a significant impact on the delivery of services to the city of Phoenix. This statement is supported by Proposition 1 passed in 2007 in order to provide monies to allow the police department to hire 400 new police officers and 100 police civilians. The purpose was to bolster manpower, reduce response times and provide better quality service to the citizens of Phoenix. If we can do without 200-300 officers now, then why did we ask citizens to vote on a proposition in 2007 to fund 500 new positions for the police department? As time goes on Phoenix continues to grow and public safety demands increase. How do you cut 200-300 police officers yet continue to forge ahead with plans to open two new police precincts at a cost of hundreds of thousands of dollars? While fire and police department management show leadership in explaining how budget cuts will impact public safety services to the community, city management seems to feel that police and fire personnel are as expendable as librarians and parks dept personnel. This sends an unmistakeable message not only to the community but to rank and file officers and detectives as well. 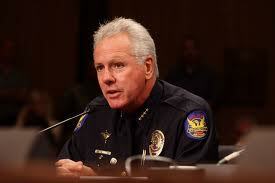 CLICK HERE to read an AZ Central article from Feb. 2008 where PSM Harris speaks of the need for more officers. CLICK HERE to read the original language on the Prop 1 ballot for the hiring of 500 additional police personnel and 100 fire personnel. In the below video a PPD Supervisor talks about how police layoffs will impact services to the community. Phoenix PD officers speak out on the impact of impending layoffs. PLEA President Mark Spencer and PSM Jack Harris speak out on the impact layoffs will have.